The Interco Reptile Radial is the latest addition from Interco. 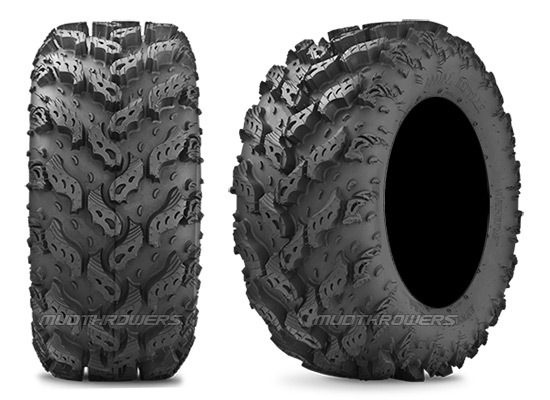 This 6 ply rated tire has advanced radial construction for the best ride and superior traction in all conditions. It has both excellent high and low speed handling. I'm running the 27" one on my King Quad 750 and I love them. I have always ran Bighorns due to the good ride and handling. So I was a little worried that I would not like these coming from Bighorns...Man was I Wrong. These tires ride and handle like a dream. I have ran them on every terrain you can think. Rocks,Mud,Hard Pack,Pavement,Creeks, and off camber trails. They hold a great side bite on the off camber stuff. They do well in the Mud...better than I though. Hold to rocks just as good if not better than Bighorns. I am very happy with them. I would highly recommend them to anyone. I'm VERY satisfied with them. Great tire for a great price. Just wanted to post an update on these tires. Right now I have about 500 miles on them. About 50-60 miles have been on pavement. We all know how that eats the tread up. They show signs of very little wear. They are holding up very well. They do great in rocks, mud, and hard packed terrain. I'm very impressed so far with the result of these tires. I would recommend them to anyone who is an all around trail rider. Will post another update around 1,000-1,200 miles.